The mountains surrounding Black Rapids, Alaska are full of amazing sights and hidden gems that are mostly unknown to tourists and even local Alaskans. Approximately 130 miles southeast of Fairbanks along the Richardson Highway, this quiet area of the Alaska Range features scenery on par with Denali National Park but without all the people. Steep, snow-capped mountains dominate the skyline. Scenic rivers, creeks, and glaciers fill the mountain valleys. A short hike above tree line leads to impressive vistas, while a long hike into the alpine can take you to epic views that few people have ever seen. This area also features abundant wildlife including moose, caribou, Dall sheep, bison, wolves, coyotes, bears, lynx, eagles and more. I offer private guided hikes and snowshoe tours year-round in these mountains, with a variety of routes available to suit everyone from the beginner to the hardy adventurer. There are no daily tour schedules here, no out-of-state college kids herding tourists, no giant tour boats crammed full of people. You won’t find any signs telling you which way to go, and most of the time you won’t see another person during your tour. It's just you and the wilderness at your own pace. For a nominal fee, I can also double as your personal adventure photographer. View all summer & winter tour options below. 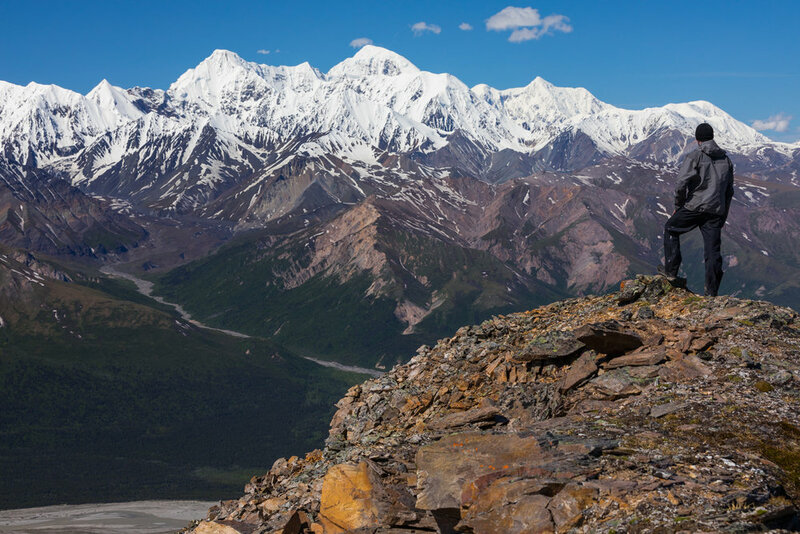 Choose from a variety of routes leading to scenic vistas, glaciers, and more. Those seeking an Alaskan-style alpine adventure will enjoy the opportunity to explore off-trail over rugged terrain where few people venture. As streams and rivers freeze over and the snow settles in, the opportunity for winter adventure begins. Hike or snowshoe to scenic vistas, frozen waterfalls, glaciers and more!